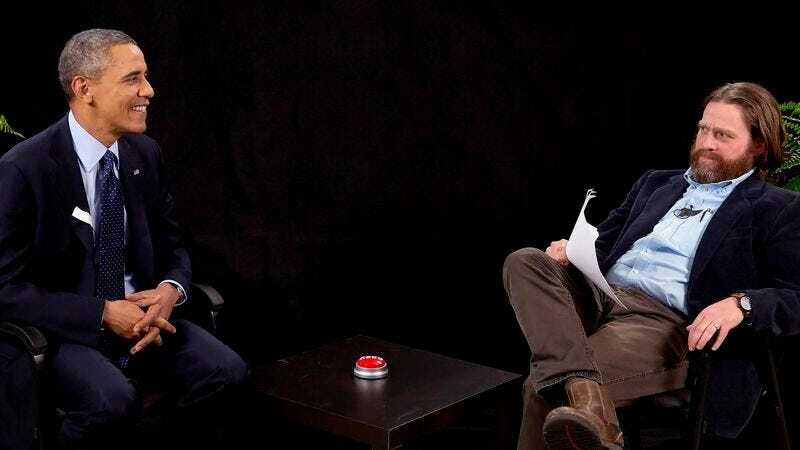 Of all the cool and meaningful things that Barack Obama did when he was in office, who knew that one of the coolest and most meaningful would be his appearance on Zach Galifianakis’ weirdo web series Between Two Ferns. The interview was a thinly veiled plug for the Affordable Care Act, a socialist scam designed to prevent Americans from needlessly dying from treatable illnesses and injuries, and traffic on the HealthCare.gov website reportedly jumped by 40 percent the day after the clip was released. It actually worked out so well for Obama and his twisted agenda that Hillary Clinton made her own appearance on Between Two Ferns back in 2016—an appearance that, unfortunately, wasn’t quite as successful as Obama’s was. The Humanitarian Award will be presented at a gala event in Beverly Hills on March 19 that will also seek to raise over $1.5 million for low-income and uninsured families in Los Angeles, and all of this ties in with a video in which a president made a joke about how stupid it was for there to be three Hangover movies. The video is so good that it just makes us sad now.